Gershom Scholem stands out among modern thinkers for the richness and power of his historical imagination. A work widely esteemed as his magnum opus, Sabbatai Sevi offers a vividly detailed account of the only messianic movement ever to engulf the entire Jewish world. 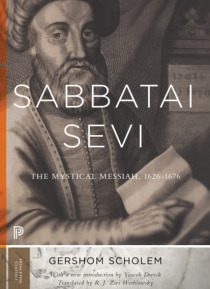 Sabbatai Sevi was an obscure kabbalist rabbi of seventeenth-century Turkey who aroused a fervent following that spread over the Jew… ish world after he declared himself to be the Messiah. The movement suffered a severe blow when Sevi was forced to convert to Islam, but a clandestine sect survived. A monumental and revisionary work of Jewish historiography, Sabbatai Sevi details Sevi's rise to prominence and stands out for its combination of philological and empirical authority and passion. This edition contains a new introduction by Yaacob Dweck that explains the scholarly importance of Scholem's work to a new generation of readers.